If forex trading can be defined in any way, it can be said to be the process of trading and managing risk. This is something many new traders find difficult to understand but perhaps one simple way to explain it is by looking at a candle pattern which, in all my years of trading, has rarely let me down and has proved to be one of the most consistent trading signals, appearing in all time frames and in all markets. The candle in question is the hammer. The hammer or, as it is sometimes called, the down thrust, occurs at the end or bottom of a sustained down trend when the bears have driven prices to the point of exhaustion, before the action is taken up the bulls, who then take control and begin the process of moving prices back up again. The end result is a candle with a small, or even non existent body , but with a very long and deep shadow. 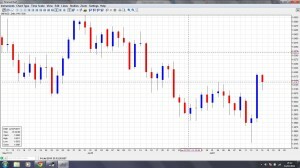 The beauty and simplicity of the hammer candle pattern is that it occurs across all markets and in all time frames and in the past couple of days we have been fortunate to see two hammers, one on the daily eurodollar chart and the other almost identical signal, but perhaps an even more dramatic example, on the daily chart for cable. As you can see from the pounds to dollars daily chart Tuesday’s price action saw the pair fall dramatically to a low of 1.5780 before recovering to close at 1.5925 leaving us with a classic hammer. This technical signal was duly validated on Wednesday, with cable climbing almost 300 pips from 1.5905 to close at 1.6183 although today, it’s no surprise to see a minor pullback following such a sharp move higher. As I said earlier, trading forex is all about trading risk and whilst adopting a trading strategy using a single candle may, on the surface appear overly simplistic and also require iron discipline and patience, the return is that the risk is dramatically reduced, given the consistency of this signal. Furthermore, the candle becomes even more powerful when read in conjunction with other technical signals – a subject for another video!The good news is that whilst these candles appear relatively infrequently on the longer term charts, they do appear more regularly on an intra day basis and are therefore equally valid, and provided you are prepared to wait and be patient, and only enter a position once the price has moved back above the close of the candle then you will be more successful than most. Of course, it goes without saying that you should always deploy a stop loss, which initially should be set below the bottom of the wick and moved up accordingly as the trade progresses.